Easy to grow - pinch the tip out, then they banch themselves. They love fll, hot sun, and feed them well. Juicy, ripe tomatoes picked straight from the plant are a luxury that everyone must experience, and these tumbling toms can be enjoyed by anyone whatever space they have. Not only are they incredibly easy to grow, they're also ideal in a hanging basket, window box, or pot in a sunny, sheltered spot where they'll look great trailing over the edges. Growing tomatoes is easy and incredibly rewarding - make salads and chutneys, or of course eat them fresh. 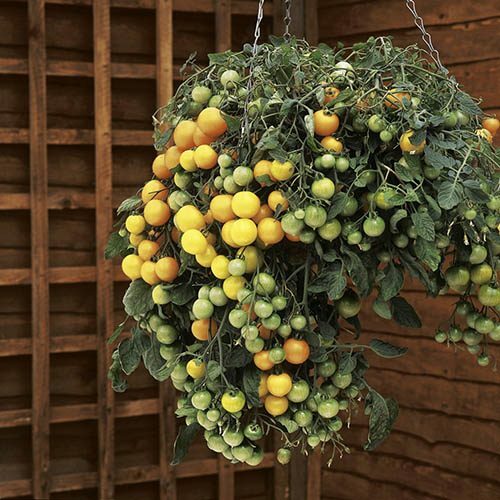 'Tumbling Tom Yellow' is the ideal variety to get started growing your own tomatoes - so easy in hanging baskets, tubs, planters and even window boxes, you will gets hundreds of small cherry tomatoes in summer. Kids love growing them too (and of course eating them), and this is a great way to start a life-long interest in gardening. Trailing tomatoes are self-branching, so other than pinching the tip out when you plant them up, there is no need to do anything else to them, unlike other tomato varieties - so they're ideal to grow if you're not a confident gardener. Tumbling Tom produces massive crops of firm, round fruit all summer long - each one packed with sweet, delicious juice. Perfect fresh and in salads. Supplied as a pack of 12 plugs, ready to plant straight outside once risk of frosts is passed. Grow on in 9cm pots beforehand. Fill in gaps in containers with sun-loving herbs such as basil or plant nasturtiums to trail over the sides. You could also add a pepper plant to the middle of your pot or basket for added height and interest. Once the plants are 10cm tall, they can be planted in the hanging basket or container, ideally using 1 plant for a 25cm basket or 3 in a 35cm basket. Tomatoes can be planted up into their containers from April onwards, and grown on for a couple of weeks before placing outside after hardening off. Cover plants with horticultural fleece on any unexpectedly cold nights. Fill containers to within 2-3cm (about 1in) of the rim with moist compost - growing bag compost or our own professional compost is ideal. Bury the roots deeply (up to first ‘seed’ leaves on the stem) and water well, to settle the compost around them. Place the containers in a sunny sheltered spot. Water regularly to keep the compost moist - at least once a day in hot weather when the plants grow larger. As soon as fruits start to form, feed the plants regularly with a liquid tomato food. Remove old leaves as they yellow to let in light and air.